Zang Xiang, is also known as the visceral manifestation. It is first appeared in the chapter of six Sections of Discussions on Visceral Manifestation in Su Wen. According to the explanation in some Chinese medical classics, "Zang" refers to interior organs which are stored inside the human body. "Xiang" has three levels of explanations: 1. Real zang-organs: such as skin, muscle and bones. 2. physiological functions of human body revealed by zang, fu-organs, meridians, qi, blood, essence：named as breath, vessel pulse and changes of expressions.3. Natural phenomena interconnected to human organs functions of essence, qi and blood, for instance, sun, moon, four seasons and climate changing. In Nei Jing (Canon of classification) compiled by Zhang Jingyue, for example, it was recorded that "Xiang means image". The viscera are stored inside the body and the image is manifested outwardly. For this reason, it is called "visceral manifestation". That is why zang xiang is sometimes translated as "viscera and their manifestations". The knowledge of anatomy accumulated in ancient times. In Ling Shu, for instance, it says, "After death, the body may be dissected and the texture of the zang-organs, the size of the fu-organs, the capacity of the intestines, the length of the arteries, the condition of the blood can all be observed... " From anatomy's point of view, such a proper understanding of the human body laid concrete foundation for the theory of visceral manifestation in morphology. The long-term observation of the human physiological functions and pathological changes. For example, catching cold may produce such symptoms as stuffy nose, running nose and cough, ancient people got to know there is a close relationship between the skin and hair as well as the nose and lung. Medical practice in which certain physiological functions were disproved analyzed in the light of pathological phenomena and curative effect. For example, eye disorders are mostly cured by treating the liver, ancient people eventually reached the conclusion that "the liver opens into the eyes". The theory of the visceral manifestation studies the physiological functions and pathological changes of viscera and their relations. It plays an important role in building the theoretical system of TCM and is significant for expounding the physiology and pathology for the human body and for guiding clinical practice. 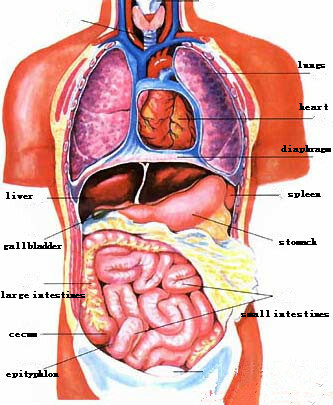 Viscera, basis for the theory of visceral manifestation, is a collective term of internal organs which, according to their physiological functions, can be classified into three major categories: The five-zang organs, including the heart, liver, spleen, lung and kidney; the six fu-organs, including the gallbladder, stomach, small intestine, large intestine, bladder and triple energizer; and the extraordinary fu-organs, including the brain, marrow, bone, vessel, gallbladder and uterus. The common function of the five zang-organs is to transform and store essence; while that of the six fu-organs is to receive, transport and transform water and food. The extraordinary fu-organs, as a kind of fu-organs, differing from the six fu-organs in shape and physiological functions, are relativity hermetic organs and do not contact with water and food directly. The six fu-organs are in charge of transporting and transforming foods, so they can be solid but not full. The reason is that the stomach becomes full and the intestines remain empty when the food is taken into the stomach; the intestines become solid and the stomach empty when food is transported downward. Holism which focusing on the five Zang-organs is the reflection of the overall concept in theory of zang-xiang, it believes that the human body is an extremely complex organic whole, indivisible parts of the human body coordinate with each other, physiologically, interlink with each other in the metabolism and interaction in the pathological changes. 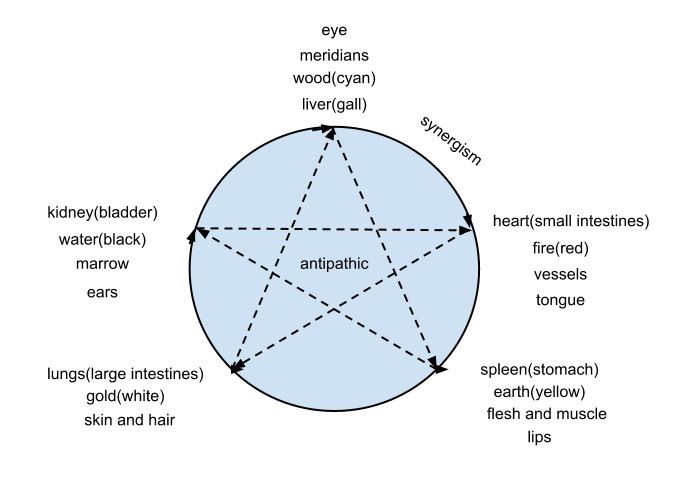 This wholeness of body embodied in three main areas: one is that the five Zang-organs, six Fu organs, body and the five sense organs constitute five functional systems through the connection of meridians, qi and blood. The second one is the restraint, reinforce of five elements between five functional systems of which maintain life activities as a whole. In the midst of five functions systems, five Zang-organs store the essence, guide the gasification, is in central position; functions of six Fu organs are subordinate from five organs; essence stored by Chi Heng fu-organs is also derived from the five Zang-organs. The five Zang-organs function forgetful, other organs of the human body to function properly, the body can be strong. Vigorous and healthy as the five Zang-organs are, other organs of the human body can function properly and the body being strong. The significance for differentiation between zang-organs and fu-organs is not only for explaining their physiological functions, but also for guiding clinical practice. For instance, the disorders are zang-organs are of deficiency type in most cases, while the disorders of fu-organs are of excess type mainly. The related fu-organs can be purged for the treatment of the excess type of zang-organs disorders, and the zang-organ can be nourished for the treatment of the excess type of fu-organs disorders. These therapeutic principles are still of great significance for now. The theory of visceral manifestation is mainly characterized by the concept of organic holism. According to the theory, the zang-organs pertain to yin and the fu-organs pertain to yang. Each zang-organ is internally and externally related to a certain fu-organ. For instance, heart is internally and externally related to the small intestine, the lung to the large intestine, the spleen to the stomach, the liver to the gallbladder, the kidney to the bladder and the pericardium to the triple energizer. These internal and external relations are deduced on the basis of the interconnection between meridians. The physiological functions are closely related to mental and emotional activities. Spirit, consciousness and thinking reflect the functions of the brain, which is already mentioned in Nei Jing. However, the theory of visceral manifestation holds that spirit, consciousness and thinking are also closely related to physiological functions of the five zang-organs, which controlled the whole body, so the brain also depends on the five zang-organs to perform physiological functions. As we can seen, the balance of the five zang-organs physiological functions is the core of maintainance of related constant of internal environment of human body. The above analysis shows that the theory of visceral manifestation, though based on ancient anatomy, was established mainly by means of observation according to the idea that "viscera inside the body must manifest themselves externally." Therefore, the result of the observation and analysis was inevitably beyond the viscera in human anatomy. That is why TCM has developed such a unique system for physiology and pathology.